It is with great sadness we have to announce the sudden death of our founder chairman and friend Ian Pringle. Ian was well known to a lot of people as a keen and passionate historian who was everyone’s “go to guy” whenever they needed help or advice on anything regarding the history or heritage of Prestwich. 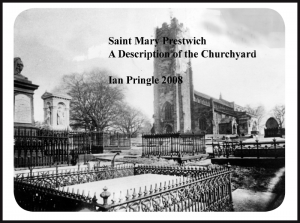 He was an author of local histories including books on Philips Park and St Mary’s Churchyard and was in the process of writing a new book on the History of Prestwich as well as a regular contributor to local papers. His sudden death came as a massive shock to all of us and although we knew that Ian had been ill for a long time his enthusiasm for the Village he loved never abated. He was frequently seen walking through the village and it’s Forest Parks as well as being a frequent visitor to Philips Park and was always happy to stop and talk about the history and heritage or even the latest eye sore. It is hard to believe that he is no longer with us especially when we think that he was recently the guest speaker at March’s Heritage Society meeting. Ian had the knack of instilling his passion for the Heritage of the area in others. It was during a discussion at Apple Day that Ian mentioned the lost Outwood Lodge which led to an Archaeological investigation to find it. He visited the dig on several occasions to see the progress as the mystery was resolved. But what he also brought to any discussion was his knowledge of the residents and people of Prestwich and the ability to bring history to life. Ian was a keen campaigner and defender of our heritage and a great communicator. He was never afraid of being a thorn in the side of anyone who he felt was failing to protect our historical legacy. The thing however that is most apparent is how many different people and Groups he helped and assisted with a vast diversity of interests and I know he will be sadly missed by all his friends and also as a defender of our Heritage. So sorry to hear about the death of Ian. We were privileged to be introduced to Ian and his help has been invaluable in my family research. He had such enthusiasm for Prestwich and a wealth of knowledge. As a fitting tribute to Ian, I hope the Historical Society can continue in his footsteps. Good evening from Salisbury Plain. I am so sad to learn of the death of Ian Pringle. I have just read his fascinating booklet on Philips Park and had looked for his email address to make contact, sadly too late. The information which I was going to share with Ian still might be of interest to your members. Not far from me, near to the town of Frome lies the splendid mansion of Orchardleigh (now an ‘exclusive’ wedding venue), formerly the home of the Duckworth family, one of whom was married to a Philips of Prestwich. In the window of the entrance hall at Orchardleigh there are several beautifully executed stained (or painted) glass armorial panels, one of which shows the quartered coat of arms of Philips and Stubbs. If anyone would like further information on the above subject do please feel free to contact me.